Newly opened route in the Annapurna region. Base camp of Mt. 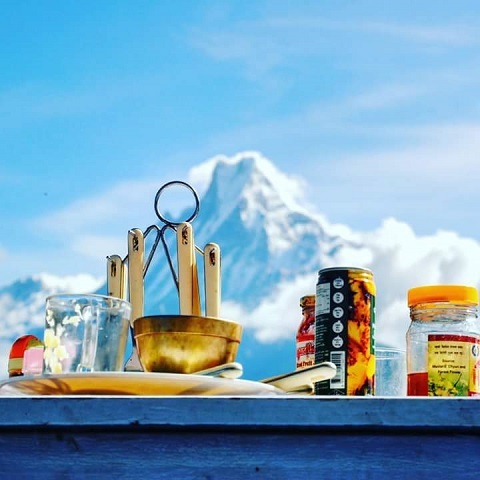 Mardi at 4100 m.
Amazing view of Annapurna, Dhaulagiri, Machhapuchre and Manaslu ranges. Mardi Himal Trek is a newly opened route in the Annapurna region and is a very short trek. Mardi Himal is one of the lower mountain peaks in Nepal. 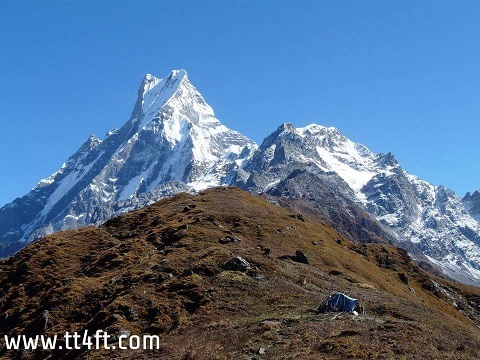 In Mardi Himal trekking, you reach the base camp of Mt. Mardi at an altitude of 4100 m. This trek offers amazing view of Annapurna, Dhaulagiri, Machhapuchre and Manaslu ranges as well as green forests and wild animals. Day 1: Early in the morning drive from Pokhara to Phedi, 1 hour then walking all the way up to Derali (1960 m), walking 3 to 4 hours. Overnight at hotel. Day 2: Deurali to Forestcamp (2600 m), walking 4 to 5 hours. Overnight at hotel. Day 3: Forestcamp to Locamp (2928 m), walking 4-5 hours. Overnight at hotel. Day 4: Locamp to Highcamp (3800 m), walking 4-5 hours. Overnight at hotel. Day 5: After breakfast, visit around base camp (4100 m) then return to Locamp. Overnight at hotel. Day 6: Locamp to Pokhara via Australian camp, walking 5 to 6 hours and by private car 1 hour. Overnight at guest house. - Porter service (salary, all lodging and meals) - 1 porter for every 2 persons. - Permits (Annapurna Conservation Entry Fee and TIMS card) . - Ground transportation Pokhara to Phedi and back to Pokhara.